The detective story, maybe more than any other genre, highlights fiction’s tricky relationship with knowledge. Traditionally, the genre is equal parts suspense and succor; embedded in every narrative delay and stray clue is a reminder of all the things we don’t know but also the comfort that the truth is on its way. As Dr. Watson notes during one case, “I confess that I was filled with curiosity, but I was aware that Holmes liked to make his disclosures at his own time and in his own way.” Watson’s confidence in Holmes, of course, mirrors our larger confidence in the literary form. In this kind of fictional universe, crime’s chaos may rule for a while, but we know that by story’s end, Holmes (or Poirot or Miss Marple or Olivia Benson) will be ready to settle in to a proper dinner, having answered every question. Over the last century, the genre’s tidier epistemological qualities have been thoroughly mucked with; Beckett, Auster, Borges, and countless others have written detective stories without proper solutions. In these revisions, the questions the genre once posed and answered itself get turned outward on to the reader. With no neat solution (or resolution) we’re forced to ask ourselves what exactly we wanted from the story in the first place and why we ever assumed we should be able to find it. At the same time, having spent dozens of hours in the house by now looking for answers as to the nature of this whole machine of events, certain of Gravey’s enunciations have in some subtle way in me seemed to ring true: as if there is something more about the spatial dimension of the building and what would come to wake inside it than one might gather simply looking. I can’t fully explain it as yet. Flood never does fully explain it. Neither does 300,000,000. And about halfway in, the novel dilates like a nuclear blast. Gravey’s arrest, trial, and execution spark a pandemic of American death — everyone dies ­— but soon even that storyline fades, focusing instead on Flood’s oneiric journey through the corpse-filled City of Sod (which he finds in Gravey’s house behind a locked door “centered on the kitchen’s northwest wall”).
. . . Charles Manson kills no one with his own hands inside the family mind of minds Taser mousepad markup language LAN PC microprocessor floppy disk email C video game console John Wayne Gacy kills more than twenty-four bodies and buries them inside his home oh here are the bodies there will be more bodies more bodies ended more bodies made Randy Steven Kraft kills at least sixteen bodies and maybe more than sixty Thomas Pynchon publishes Gravity’s Rainbow personal watercraft recombinant DNA catalytic converter mobile phone . . .
That stability, of course, is nowhere to be found, ­and if we’re smart, we’ll stop looking for it. 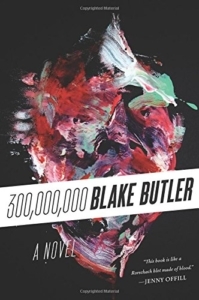 Gravey’s crime has no solution, and Flood’s dissipation is really more about those things that have marked all of Butler’s fiction up to this point: sound, recursivity, and space. 300,000,000 doesn’t progress as much as it constricts and expands, thrums and swells like a neoplasm: “Any distortions in the story are the story.” Its physical spaces exist as both a container of and witness to our actions. It’s claustrophobic to be in a field of so much repeating death, to be faced with page after page of endless chatter; the voices here amplify and never let up. But a unique kind of exhilaration sets in when you relent to the waves of atmosphere and dread, the music and menace that pulse through Butler’s sentences with a centrifugal force. Just as I could not escape death as an idea by hoping only to live on in my private memory alone, what slaved beyond death remained constant in us all, and could not be granted without the false originalities of massacre and aspiration having been at last truly compressed beyond the idea of any person: image or language, never or now.